Science completely hides a 3D object for the first time. Who doesn't love it when fantasy and science fiction tropes become a reality? Well, guess what, the invisibility cloak isn't just for Harry Potter and Star Trek anymore. Previous attempts at such a technology have relied on covering an object with a "metamaterial" that would bend microwave light. 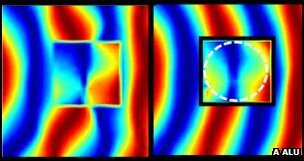 The technique created an effect that rendered most object undetectable, but a new technique has emerged that accomplishes the same effect without the use of metamaterials. A group led by Dr. Rainwater at the University of Texas published a paper in the New Journal of Physics proving it is possible to tailor a free-standing cloak to render a 18 cm cylinder invisible. "[The cylinder] is a real object standing in our lab, and it basically disappears," said the spokesperson for the group, Professor Andrea Alu. The science of the experiment is a little hard to grasp, but I'll give it a whirl. Instead of covering the object with an actual "cloak" of metamaterial that bends light, the Texas teams devised a "shell" that has the exact opposite properties of the object. The shell cancels out the actual object so that it remains undetectable. "We realize a shell that scatters [light] by itself, but the interesting point is that if you combine the shell with the object inside, the two counter out and the object becomes completely invisible," Alu said. Don't go counting on buying an invisible car in 2020; there are still a lot of bugs to work out. The exact design of the "shell" would need to be different for each object, and the technique won't work with light in the visual spectrum, only on a microwave level. Still, there is a lot to be excited about using a "plasmonic" approach to cloaking technology. "There is still a lot of work to do," Alu said. "Our goal was just to show this plasmonic technique can reduce scattering from an object in free space. But if I had to bet in five years what kind of cloaking technique might be used for applications, for practical purposes, then I would say plasmonic cloaking is a good bet."